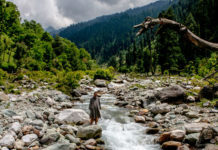 Named after two lakes (Sana & Sar) and located about 20 km west of Patnitop on NH 1A, Sanasar is situated at an altitude of 2050 m, Sanasar—popularly referred to as a mini Gulmarg. It is one of the remotest areas in Jammu having stunning landscape of blooming meadows surrounded by thick forests. It is regarded as the aero-adventure-sports capital in the region offering tourists a host of activities including rock-climbing, rappelling, paragliding, parasailing and hot-air ballooning which makes it is the perfect spot for adventure lovers. Sanasar Lake: 119 km from Jammu and only 17 km from Patnitop. Named after small local lakes, ‘Sana’ & ‘Sar’ are located 20 km west of Patnitop, on the national highway 1A, in the Jammu province of the state of Jammu & Kashmir, India. At an altitude of 2050 m it is the hub for adventure sport activities in Jammu region. At 11 km from Patnitop, Natha Top offers scenic views of the mighty western (Kishtwar) Himalayas and the lower Shivalik range. The Bramha Massif, with its prominent peaks of Brahma 1 and 2 & Flat Top, is clearly visible. Eight kilometres down the road, from Natha Top, is Sanasar, with Matha top falling en route. As you approach Sanasar, the range on the right is Shanta Ridge, with the ShankPal Nag temple situated at its highest point of 2800 m.
Best Time To Visit: May-June and September-October. Horse Riding: Sanasar known for its green alpine meadows, low rolling hills, high peaks and beautiful lakes and rivers-Jammu & kashmir is truly blessed by nature. 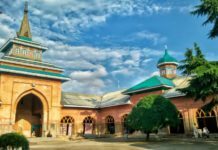 With so much of geographical diversity, kashmir is a paradise for adventure seekers. From hiking, trekking, snow skiing to horse riding you can experience everything on this mountainous region of India. 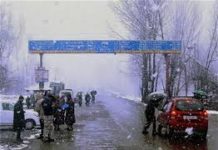 gulmarg, Sonmarg, srinagar, sanasar etc. are some of the places ideal for adventure sports. While horse riding in kashmir is something, which you will enjoy thoroughly while exploring this magical land. Besides visiting various places, you can also indulge in various adventure activities like hiking, camping, skiing, horse riding etc. good horse rides. Yousmarg also have riding tracks and opportunities though in nomadic way. With rolling hills and soothing lush greenery all around, seeing kashmir on a horseback is something you would remember for life. The hotels and resorts also make arrangement for horse ride on request. Exploiting the lush green coverage – which is just right for the royal and prestigious sport – Golf, a part of Sanasar has also been developed as a Golf Course open for tourists to try their hand at it. The Jammu and Kashmir Tourism Department promotes and controls adventure sports in Sanasar and provides the sports gear as well for those who want to indulge in the sports. Summer temperatures between 10-20 degrees Celsius provide an ambience conducive for these adventure sports and also make them enjoyable. Because of their in-built characteristic of high level of danger, certain sports that involve height, speed, depth, special maneuverability and other uncontrollable environmental aspects, are grouped as Adventure Sports. Primarily because athletes are not only competing against each other but also against elements of nature such as gravity, wind-speed, speed of water rapids etc., these sports are termed ‘Extreme’ and require a certain level of training before embarking upon them. Water sports include free-diving, scuba-diving, jet-skiing, snorkeling, and land sports include cliff-climbing, skate-boarding, extreme-skiing, car-racing, whereas air sports include bungee jumping, paragliding, and sky-diving. And Sanasar is home to few such adventure sports. Previous articleSpend a day in Kokernag and go mesmerised !